In her debut book The Daughters, Joanna Philbin introduced us to three best friends: Carina, daughter of one of the richest men in the world; Hudson, daughter of a famous pop star; and Lizzie, daughter of a super model. 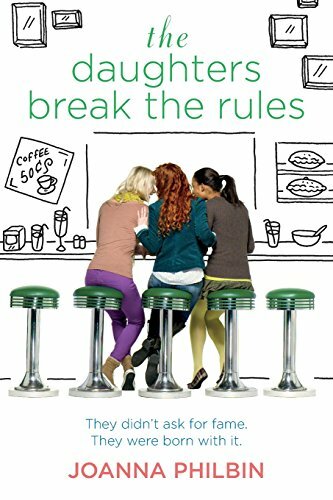 Whereas the first book focused on Lizzie’s rise and fall in the modeling world, The Daughters Break the Rules focuses on Carina and the consequences following her rebellious act of sending a damaging memo to the Smoking Gun regarding her father, which almost results in a one-way ticket to California and boarding school. Carina’s anger toward her father has hit an all time high, and in response to her continued defiance and petulance, her father has decided to cut her off—no more credit cards, bank accounts, chauffeured rides to school, and goodbye iPhone. Now Carina will have to make it on $20 a week, a Metro Card, and an archaic cell phone from the mid 90s. Though the $20 is going to be tough to pull off in NYC, Carina is ready to prove to her father that she doesn’t need his money—that is until her major crush, Carter McLean, invites her to the Swiss Alps for a ski trip. Despite her BFFs’ dislike for Carter, Carina is set on going and formulates a plan to get the money for the trip. Planning to use her for her father’s business contacts, queen bee of the popular set, Ava Elting, asks Carina to help her plan the Snow Flake Ball charity dance. Carina agrees, despite knowing she can’t ask her father for help. Carina requests $1000 to plan the party—which should pay for the ski trip—and promises to make it the “NY Times Style” event that Ava wants. Finding out that none of the top tier people Ava wanted are willing to work for free, Carina gets creative and in the process meets Alex Suarez, an artsy DJ from the lower East Side. Through Alex she learns a lot about self-respect, the importance of family and that sometimes the best things in life are free. Once again Joanna Philbin does a great job keeping everything toned down and fairly realistic. With the emphasis more on Carina in this book, we really didn’t get to see much of the other two girls, but Philbin manages to slip in the usual teen issues of growing up and slightly apart. The girls are now getting boyfriends and, although their bond is still strong; their time together is a bit more limited. Ms. Philbin expertly handles the evolution of Carina as she develops into a more mature and responsible person, without making it seem contrived and convenient for the plot. Though she doesn’t come off as a snobby brat to begin with, even Carina realizes how excessive she has been in the past with clothes and money; and begins to focus more on being a better person inside, rather than out. As usual, there are important lessons to be learned: always be honest, don’t take your loved ones for granted, and never jump to conclusions when you don’t know all the facts. Good lessons no matter what your age. The Daughters Take the Stage is due out May 2011.